I’m a sucker every time for creative packaging, so the Ciate Beach House Collection is absolutely ticking that box. It arrived about ten minutes ago by post and when something’s interesting enough that it goes from opening post to being live on the blog in moments, then it’s a sure winner! As you can see, the Ciate Beach House Collection contains five mini size shades of Ciate polish – starting with the hot orange at the front and working down the row we have: Hopscotch, Pepperminty, Party Shoes, Amazing Gracie and Knickerbockerglory, so a complete mix of brights and lights with a sparkly top coat to wear over or alone. I’m wondering what’s coming up from Ciate for autumn/winter.. how many house options are there? Igloos? Whatever, I love these for being all kinds of gifty and just for doing things a bit differently. Ciate Beach House Collection launches in June for £18. The post Ciate Beach House Collection appeared first on British Beauty Blogger. 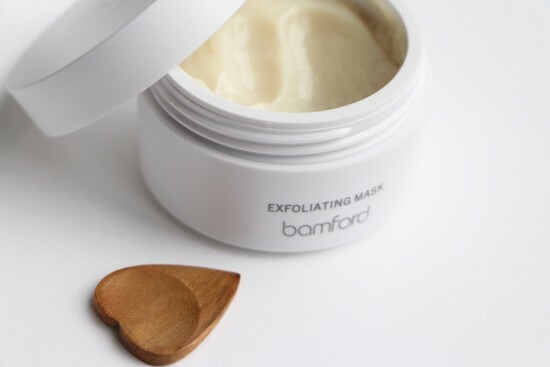 Bamford Exfoliating Mask / Do You Whittle? 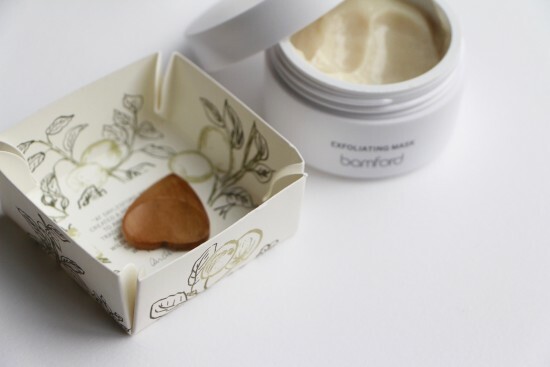 Comments Off on Bamford Exfoliating Mask / Do You Whittle? Another should-I-or-shouldn’t-I-post-about-it-because-it’s-pricey beauty situation: Bamford’s really quite delicious Exfoliating Mask. It’s somehow smoothing and soothing all at the same time, which is quite some feat. A little bit of exfoliating tingle, but a remarkably fresh feel and the kind of juicy gel texture you might find in an intensively hydrating aftersun mask. I loved it on first use – my skin looked very even and radiant afterwards, with none of the redness you might find with some powerhouse exfoliating masks. And my skin felt – I suppose the word would be – toned. Not tight and squeaky, as though it had just lost most of its outer layers, but revitalised, as though it had undergone a bit of a buff followed by some kind of toning essence or lotion. Don’t get me wrong; the exfoliating action (lactic acid, fruit enzymes) seems to be very proficient, and there’s a touch of clay for some deep cleansing action thrown in, so I’m not saying that this is some namby-pamby mask. It’s just that it feels so beautifully plumpy and nice. Indulgent. Indulgent price, too – sixty quid. You do get a little wooden heart to scoop out the mask, but if you’re good at whittling then that won’t be too much of a draw. Ha! I jest, of course: who whittles in this day and age? I don’t know a single whittler. Mr AMR can sharpen sticks when required to (if we’re out trapping the odd woolly mammoth or staking out a new reed screen for the mouth of our cave) but I doubt he could whittle me a heart. Anyway, the heart is obviously a nice touch, I’m being facetious. So is the beautiful printed box and the simple, modern packaging, but it’s still a proper luxury. Up there with your Omorovicza and Tata Harper and Aurelia and Dr Sebagh. I’m trying to think of an affordable alternative for this with the same fresh juiciness and good exfoliating prowess, but I shall have to come back to you. For those hunting down a lovely mask that’ll slot easily into their weekly facial routine (Sunday facials seem to be all the rage at the moment!) this is well worth a look. Especially if you find that you don’t get on with glycolic-based exfoliants, or fancy something a little lighter and fresher in texture. If you want to browse previous mask reviews then they are all here. Also, do let me know if you whittle. I’m genuinely curious. Bamford’s Exfoliating Mask is £60 at Net-a-Porter here. The post Bamford Exfoliating Mask / Do You Whittle? appeared first on A Model Recommends. Annoyingly, because I had about three million bottles at home waiting to be tested out, I forgot to pack nail polish for my holiday. I didn’t have time for a manicure or pedicure before I went, so I had envisaged taking all of my nail-perfecting stuff with me – oils, buffers, weird pointy sticks that I don’t have a clue what to do with – and having some sort of rudimentary mani-pedi session. Anyway, as it turned out, I didn’t manage to remember anything nail-related at all apart from a single polish-removing wipe, which was shoved in a pocket of my washbag along with a brush-cleaning tissue and three unpaired and very dusty earplugs. So, to cut a very long and boring story short, I had to buy nail varnish at Heathrow. And I wasn’t very well going to buy a polish that I already had sitting at home, so I went into Boots to look at the Barry M ones – everyone seems to go on about Barry M, so I thought I’d see what the hype was about. They had a lovely array of shades, considering that I was just in the little Boots at Terminal 5, and there were a few different finishes on display too. I went for a “Gelly” polish in coral for my toes and a nail varnish for my fingernails that was called Peach Melba. The Peach Melba applied beautifully, I thought. One coat was almost enough; two was plenty. It dried quite quickly – no doubt helped along by the thirty degree heat – and looked nice and shiny even without a topcoat. Almost too good to be true, really, but then my cynicism was rewarded when two nails chipped after about twelve hours of wear. One whole week later (I’m doing an experiment with it, you see – testing it to the limits) and although the left hand is almost perfect, apart from some wear at the tips, the right hand looks as though I’ve been trying to paint the nails with slightly yellowed Tippex, whilst wearing a blindfold. So the right hand didn’t fare very well at all – chips all over the shop after twenty-four hours and one nail with some kind of weird marbling on it. But you know what? It was £2.99 that polish. £2.99! A lovely, peachy holiday colour that looks great with a tan – even if I’d used up the whole bottle, reapplying every couple of days, it would still have been a total bargain. You can find Barry M online at Boots.com – are there any longstanding Barry M users here? How do you find the “Gelly” polish? Let me know. It’s buy-one-get-another-half-price at the moment, you can find them here.